For a while now Taurus® has been manufacturing a line of polymer-frame pistols called the Millennium series. I’ve always been impressed with this pistol, especially with the double-action/single-action striker available in the Pro models. The striker is cocked when the slide is pulled back, and the pistol comes with an external safety to prevent the striker from falling accidentally. In case of a misfire, the striker can be activated again with a long trigger pull thereby providing second-strike capability without having to manually clear or cycle the pistol. Taurus® has improved on this line of pistols through the 24/7 models. 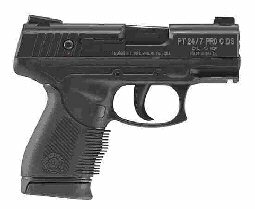 I’m always on the lookout for a better concealed-carry pistol, so when I found a 24/7 compact in .45 ACP at a great price, I decided to buy it. Besides having the DA/SA striker, this gun also comes with a decocking feature built into the manual thumb safety, although the manual suggests carrying the gun “cocked and locked” with the striker cocked and the safety on. Additionally, the gun comes with a loaded round indicator, and a cocked indicator which provides a red, visual indication that the striker is cocked. The first problem I noticed with this pistol was that it would not feed hollow-point ammunition reliably. The barrel has a built-in feed ramp that is very steep; almost, but not quite vertical. Hollow-point defensive ammo has a truncated cone or flat nose profile. The first 2 or 3 rounds out of the magazine would get jammed between the slide breech face and the feed ramp. Tapping the bottom of the slide would cause the round to feed, but this could be deadly in a defensive situation. 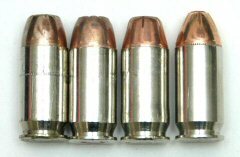 The instruction manual that came with the pistol clearly states that the gun is designed for 230 grain, full metal jacket (FMJ) ammunition. I believe this would be 230 grain, round nose, ball. And in fact, the pistol fed full magazines of ball ammo all day without a hitch. Unfortunately, ball ammo is not the best defense ammo. I was using Federal 230 grain Hydra-Shok® ammo (far left in the photo above). I compared this to some Hornady 200 grain XTP® ammo that I had (2nd from right in the photo above). The XTP® ammo fed with no problems! When I examined the bullet shapes I found an interesting difference. Notice in the above photo the Hydra-Shok® bullet on the left has a more round profile, while the XTP® bullet second from the right is more conical. Also, the tip of the XTP® bullet appears to be slightly more rounded than the tip of the Hydra-Shok® which is flatter and sharper. Apparently the rounder nose and narrower profile allow the XTP® cartridge to feed more reliably. That is why I always test my carry ammo for function and reliability before trusting my life to it. I also had a box of Winchester 230 grain SXT® ammo (2nd from the left in the photo above). When I compared this against the other cartridges, I found the SXT® had a similar profile as the Hydra-Shok®, but they seemed to feed reliably. On closer examination the SXT® bullets were also slightly more rounded at the tip then the Hydra-Shok® bullets. However, if I left the magazine loaded with the SXT® rounds, the spring would settle just enough to prevent them from feeding. I experienced the same feed jams. I purchased some Hornady® 185 grain Critical Defense® FTX® rounds (far right in the photo above) which have a longer, narrower conical shape. These rounds seem to feed well, although there’s a slight hitch when the round engages the feed ramp. I left the FTX® round sit in the magazine for a few days to allow the magazine spring to settle and they still fed reliably. So obviously the answer here is to use the right ammunition! The other problem this pistol had was it would not eject a live round. Although this gun has second-strike capability, and a misfire is very rare, still I could have a dead round and would need to be able to eject it without having the round hang up. As you can see in the above photo, the nose of the round is jammed between the barrel hood and the slide. Part of the problem is the heavy recoil spring and short stroke of the compact slide. I can’t seem to get the slide back hard enough or completely enough to eject the round. The other problem is the large radius on the front of the ejection port which prevents the round from clearing the port. Once again, this was using the Federal 230 grain Hydra-Shok® cartridge. When I changed to the XTP® cartridge I was able to eject a live round due to the narrow bullet shape. When I attempted to eject a 230 grain ball round it, too, would not eject. As stated before I don’t normally shoot ball ammo, but overall length seems to be another contributing factor. I wanted the pistol to eject hollow point ammo reliably so I carefully took my high speed rotary tool with a small diameter grinding stone and reduced the radius of the front corner of the ejection port. This corner needs to be round, not square, to prevent the slide from cracking at this location. I polished the new radius with a Cratex bit, then cold blued the exposed metal. This might void the excellent Taurus warranty, but I’d rather have reliability. Many guns are somewhat ammo specific, and this compact pistol is no exception. To feed reliably it requires a cartridge with a conical, more rounded tip. Because hollow point ammo is slightly shorter than ball ammo, my “adjustment” to the front corner of the ejection port allowed me to consistently eject a live round. I am now using the Hornady® 185 grain Critical Defense® FTX® ammo. This cartridge feeds and ejects reliably with the added benefit of better expansion. © Copyright 2010 Roy Seifert.